The XT4015 brings space-saving design to the Posiflex family with a terminal that folds and configures to an optimal angle and space. The low-profile design fits in the tightest of spaces, reducing shipping costs up to 40%. With this sleekly designed exterior comes the power needed to run and secure most applications for hospitality, retail, health care and more. XT4015 offers a choice of three powerful Intel processors, the G540, 2.5 GHz, the Core i3-3220, 3.3GHz or the Core i5-3550s, 3.7 GHz to give you the choice of the price / performance you require. To secure valuable data, the XT4015 optionally offers RAID 1 (disk mirroring). The XT4015's bezel-free projective capacitive or resistive touch screen terminal comes standard with 4GB DDR3 RAM, and can be upgraded up to 16GB. Along with a rich array of connectivity features is the option for a mini-PCIe slot for Wi-Fi and a VESA wall-mount bracket. 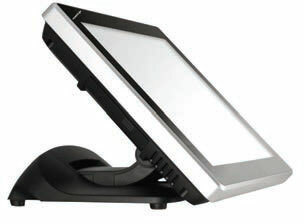 The Posiflex XT4015111D1E is also known as Posiflex Business Machines	POS-XT4015111D1E	.